Potty training your new puppy is actually much easier than people think but it does require some commitment and the ability to put up with a bit of hollering on the puppies part. First things first. We don’t believe is striking the puppies we are trying to potty train. The more modern school of dog training teaches us that dogs and Puppies respond way better to positive reinforcement, meaning praise or treats, than they ever will to brute force. Rub the nose in it? Lets also dispel the rumor that EVERYONE who has a friend- neighbor- coworker- or parent will tell you to rub a puppies nose in mistakes spank them with a rolled up newspaper and many other equally ineffective methods. Lets face it….. many dogs eat poop so how is it a deterrent to “rub their nose in it? Answer it’s not. Without the ability to crate your puppy your will more than likely never have a 100% potty trained dog. Selecting the proper size of crate is vital to your success. The puppy crate is usually not the one your grown dog ends up in. 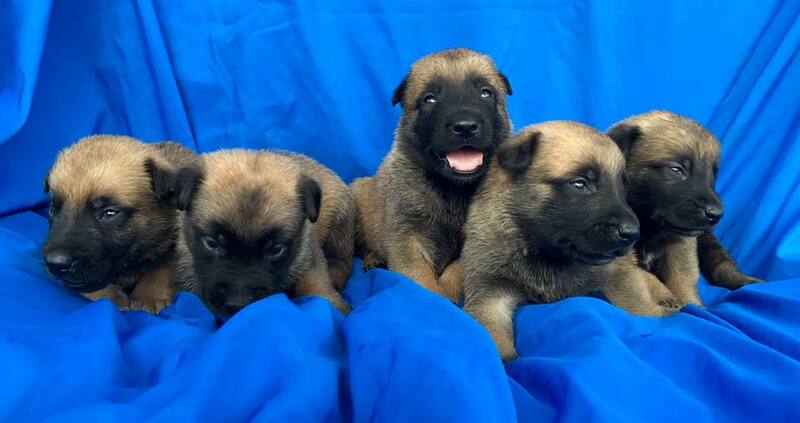 For the Malinois and German Shepherd you’ll be looking for the size that the puppy can stand up and turn around in one that the ears almost touch the top of the crate usually referred to as a 28 size crate for puppies 8-12 weeks and a size 36 crate for puppies 3 to 6 months. You can donate your puppy crate when your dog out grows it to your local spca. They can always make use of unneeded crates. First off get yourself used to the idea that during a short introductory period, if your puppy has not been confined before (and many times even if he has) He/she is going to scream. Seriously holler…… howl bark scream whatever you want to call it…. It won’t be pleasant. If your one of those people that just can’t tolerate babies crying or dogs howling you better have a place to put the pup in his crate like the garage carport or shed. The most important thing is that the dog is not ever EVER please write this down NEVER ever let a screaming puppy out of a crate. If you give in and let him out….. Well you are creating a monster that will always howl and probably never be housebroken. You owe him better. You owe yourself better. What Do I mean by that? Well much like people, Dogs are individuals. Some value hugs praise and affection shown by their handler more than others. Some LOVE treats like liver or hot dogs or beef jerky. Some LOVE to fetch or play tug of war. Learn early on what drives your puppy and you will have a wonderful tool to use in your training of your dog as a way to pay him in his preferred currency! what about the Un-trainable case…. Now I get a lot of emails about allegedly un-house-breakable dogs…. From people who refuse to crate their “babies” because it seems cruel. Let’s dispel that myth right now. Dogs are not Humans, they are Canines. Where do canines live in the wild? Anybody…… just blurt the answer out if you know……. Yes that’s right they live in Dens! What is a den? It’s a small (barely enough room to turn around) cave or hole dug in the earth by the Gyp as a safe place to whelp and raise her young. Dogs seek out the safely of small enclosed spaces NATURALLY that is why your dog loves to lay at your feet under the computer desk or in the corner under the bar. They are seeking the safety and security that is hardwired into their DNA by 1000s of years of evolution. Therefore putting a dog into a crate is NOT cruel. It is in fact catering to their need to be in a safe confined spot. Ok so we have our Puppy, we have our crate, were determined NOT to allow a screaming puppy to come outside of the crate… when Do we let him out? Puppies need a schedule. Basically they will need to relieve themselves immediately upon waking up, after play, after eating/drinking and before going to bed for the night. For younger puppies they sleep a lot and will need to potty every time they wake up. In My house I NEVER allow untrained dogs run loose in my home. I don’t allow puppies free range of the house for several reasons. First thing in the morning your puppy needs to go outside. For small pups I will pick them up out of the crate and carry them outside to the potty spot. This takes away any chance they will squat on the floor before making it outside. They will need to pee several times and usually poo several times. Walk around a bit and they normally follow you. For older pups that you are house-training give them NO inside out of crate time in the house other than right after being outside and potting. Some puppies especially older ones will want to romp and play when you take them outside, they need to potty trust me! You have to walk around outside with them until they go. Otherwise they will go the second you get inside. Schedule your time so that you have 15-20 minutes of outside potty time and are not rushed heading off to work appointments etc. when the pup is out, all you do if focus on him. If he starts sniffing turning in circles Take him immediately outside and praise him when he goes potty. Make doing the right thing, the easy thing, a BIG deal, praise him and tell him he’s such a good boy make it FUN! Giving treats in perfectly ok. IF you do this your pup will be potty trained in about a week. Nothing to it really; you just have to commit and make it happen. IF you mess up and let the puppy potty inside first off DO NOT spank the pup, do not yell at the pup. After all he’s only being a puppy which is his job. It is YOUR responsibility to watch him and do nothing else while he’s loose inside your home. You messed up not him, that’s OK, you will do better next time. Make it a NON-event, Clean up the mess don’t be mad at yourself and move on. Clean up and start over.